Veeam Backup & Replication automatically excludes VM log files from backup to make the backup process faster and reduce the size of the backup file. At the Virtual Machines step of the wizard, click Exclusions. Use the toolbar at the top right corner of the window to switch between views: Hosts and Clusters, VMs and Templates, Datastores and VMs and Tags. Depending on the view you select, some objects may not be available. For example, if you select the VMs and Templates view, no resource pools, hosts or clusters will be displayed in the tree. In the displayed tree, select the necessary object and click Add. Use the Show full hierarchy check box to display the hierarchy of all VMware Servers added to the backup infrastructure. Select the VM in the list and click Edit. If you want to exclude disks of a VM added as part of the container, click Add to include the VM in the list as a standalone object. Choose disks that you want to back up. You can choose to process all disks, 0:0 disks (typically, system disks) or add to the list custom IDE, SCSI or SATA disks. 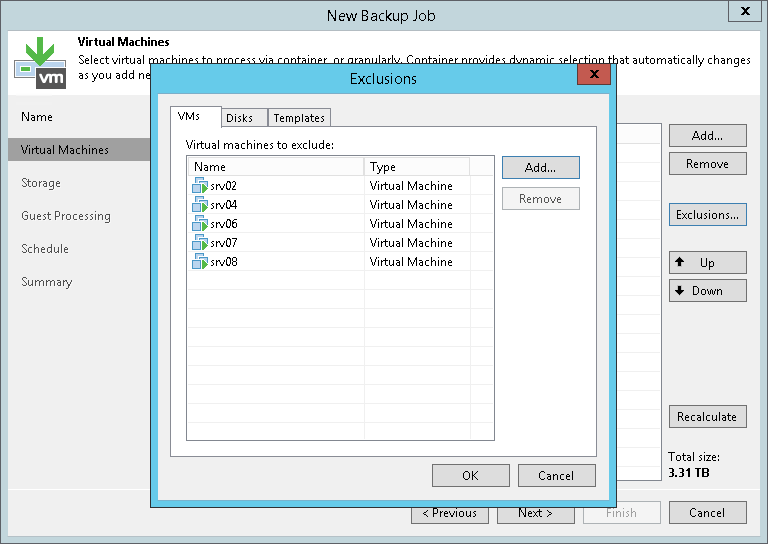 Select the Remove excluded disks from VM configuration check box. Veeam Backup & Replication will modify the VMX file of a backed-up VM to remove excluded disks from the VM configuration. If you restore this VM from the backup file to a location where excluded disks are not accessible with the original paths, you will not have to manually edit the VM configuration file to be able to power on the VM. At the Virtual Machines step of the wizard, select a VM container and click Exclusions. 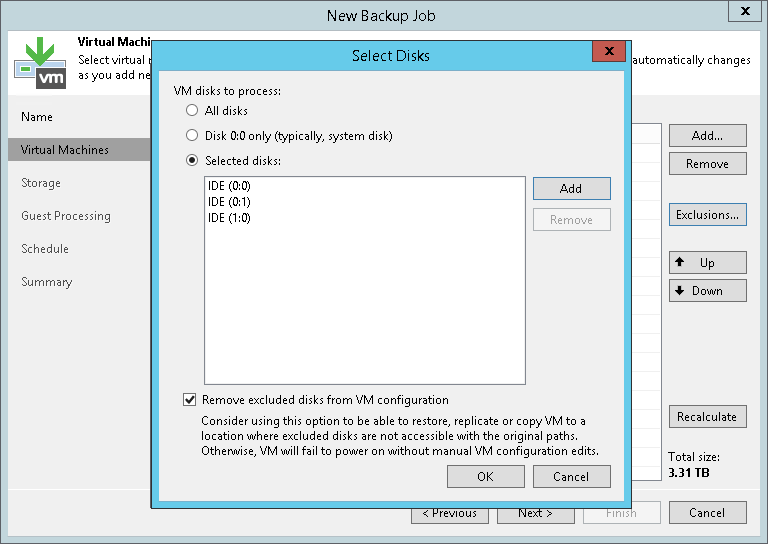 Clear the Backup VM templates check box. 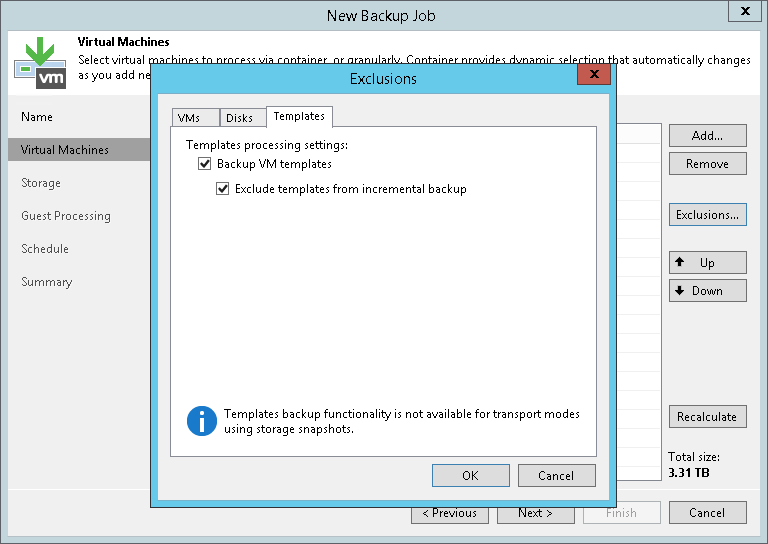 If you want to include VM templates into the full backup only, leave the Backup VM templates check box selected and select the Exclude templates from incremental backup check box.